Gorgeous pitch-black mirrors are accented by a touch of amber toning along the obverse rim. The biggest kick is the borderline Cameo obverse and reverse devices on this gem! Cameo Walking Libertys are extremely rare, with 1938 and 1942 the only two years boasting a Cameo graded on NGC’s census. 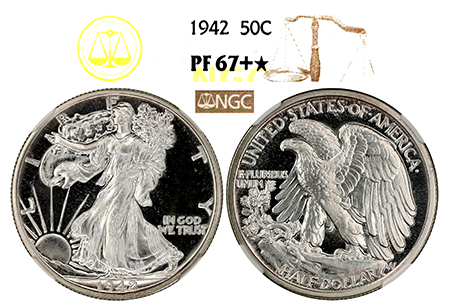 For 1942, NGC has graded 6 examples total in all grades Cameo. This 1942 is 1 of 4 examples graded PF 67 Plus STAR! This stunner boasts deep, reflective mirrors and frosty devices Walking Libertys are known for!